This recipe can be found here. I came across this recipe in the September 2010 issue of Good Housekeeping. It was on page 56. I made a few slight changes to the original recipe. Meanwhile, in 9-inch pie plate, mix 2 cloves garlic, crushed with press; 1 teaspoon oil; and 1/4 teaspoon each salt and pepper, then rub all over chicken breasts. In large bowl, combine tomatoes, basil, vinegar, 1 teaspoon oil, and 1/8 teaspoon each salt and pepper. Let stand. Spray a glass baking dish with Pam. Bake the chicken for 30 minutes or until it reaches 170 degrees. Cut remaining clove garlic in half. Rub cut sides all over bread, then brush bread with remaining 1 teaspoon oil. Bake at 350 on cookie pans for 5 minutes. I also like to throw the tomato mixture into the oven to heat up as well. While the bread is heating slice the chicken. 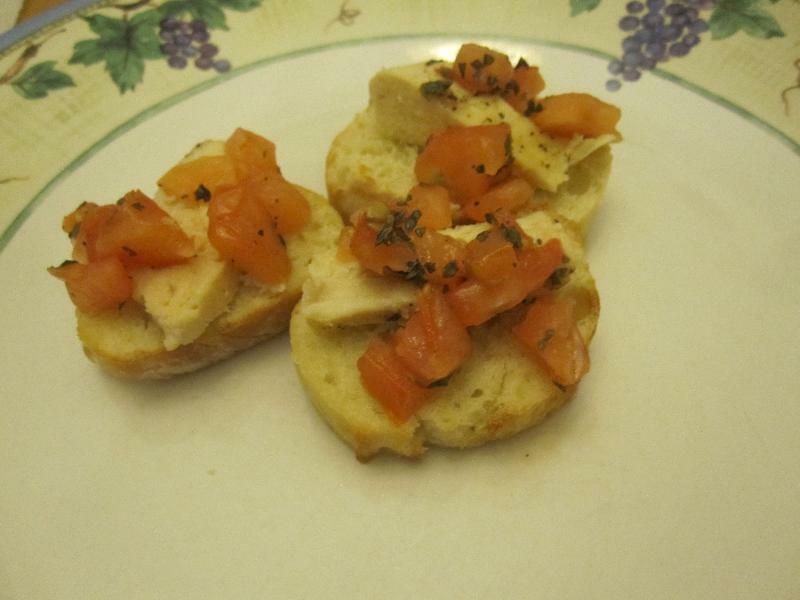 Divide the bread and chicken among serving plates; top with the tomato mixture.